The flux and change that mark the financial picture of our industry today bewilder companies around the world. There is no single solution to address falling revenues, but it is clear that news publishers must get better at exploring diverse revenue streams outside print advertising, which is declining precipitously around the world, and away from digital advertising, as the increase in digital ad dollars cannot keep pace with the print decline. So, pivot instead to reader revenue. A fundamental shift in business models two years ago saw newspapers launch a major push to increase their audience-based revenue. And now reader revenue is a growing trend, “as news publishers continue a concerted effort to build loyal audiences around their high-quality journalism,” according to WAN-IFRA’s Director of Insights, Dean Roper. SO, ARE PEOPLE PAYING FOR NEWS? AND IF SO, WHY? There are signs that consumers are willing to pay for news. According to new research from The Media Insight Project, a collaboration of the American Press Institute and the Associated Press-NORC Center for Public Affairs Research, more than half of all U.S. adults – 53 per cent – pay for news in some format across print and digital, including nearly 4 in 10 young adults under 35. 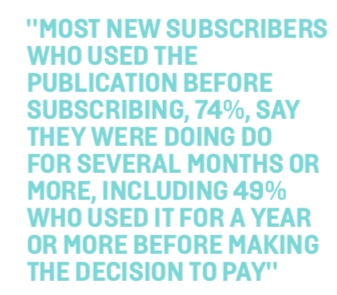 A further 52 per cent of those who do not subscribe are what the study calls “news seekers,” who actively seek news out instead of passively bumping into it, who get news multiple times a day, and generally think there’s plenty of free content available. 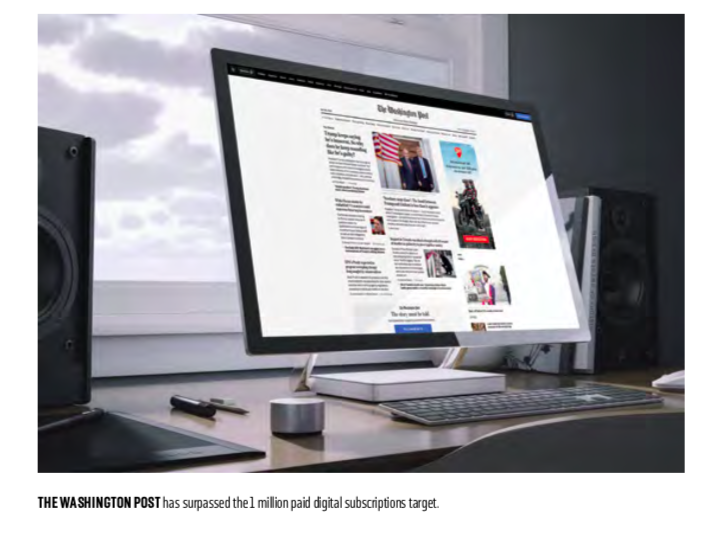 Looking purely at online news, the 2017 Reuters Institute Digital News Report found that eight per cent of American respondents had an online news subscription and a further eight per cent had made some kind of payment for online news. Norway had the highest percentage of news subscribers out of the 33 countries surveyed, at 15 per cent, with only three per cent in the UK, Germany and France. The Digital News Report found that the most commonly cited reasons for paying are broadly related to convenience: to get access on mobile devices (30 per cent of respondents across countries) or because people like to consume news from a range of sources that includes paid-for providers (29 per cent) or because of a good deal or print/digital bundle (23 per cent). Readers do pay for news out of an appetite for quality content, however. A qualitative study done for the Reuters Institute by Kantar Media looking at the UK, US, Spain and Finland, found that in terms of types of content, people are more likely to pay for specialist and exclusive content, evergreen content, and content that offers plurality of views and perspectives. There was a feeling particularly in the UK and US, researchers found, that paying for news would protect them from ‘fake’ news. The Media Insight Project found that subscriber age led to different behaviour. “The two youngest age cohorts who pay (18-34 and 35-49) also behave differently than older subscribers. They are motivated more by a desire to support the news organisations’ mission. About two-thirds of them who use Facebook use it several times a day (compared with half of older subscribers), and many say that discovering a news source through social media was a key factor in deciding to pay,” the study stated. The key to reader-based revenue streams in 2018 and beyond is to use them in conjunction with other revenue streams. It isn’t sustainable for the industry to rely on just one reader revenue stream. So, with that in mind, here are some developments and success stories in reader revenue models from news publishers around the world. Engagement over time makes people more likely to subscribe to news, according to a Media Insight Project report published in February 2018. The study, “Paths to Subscription,” surveyed 4,100 recent newspaper subscribers across 90 newspapers from 12 newspaper companies in the U.S.
“Most new subscribers who used the publication before subscribing, 74 per cent, say they were doing do for several months or more, including 49 percent who used it for a year or more before making the decision to pay,” the report stated. But, what pushed them to subscribe was a trigger. “Discounted subscription pricing comes out as the most important trigger by far, with twice as many people identifying it as any other,” the report added. Some publishers are experimenting with new ‘dynamic’ paywalls that allow different levels of access to non-subscribers that are adapted to make them most likely to subscribe. The Wall Street Journal, which launched a pay- wall in 1996, now makes more money from readers than from advertisers, after circulation revenue surpassed advertising revenue last year. For many years, it had a hard paywall where anything beyond a headline was only visible to subscribers, although it did participate in Google’s ‘first click free’ initiative until early 2017. However, following testing of different avenues for non-subscribers to access content for the past couple of years, the paper is using a subscription prediction model. Non-subscribers who visit wsj.com get assigned a score based on more than 60 elements, based on things like the device they’re visiting the site with, their content preferences, or their location. 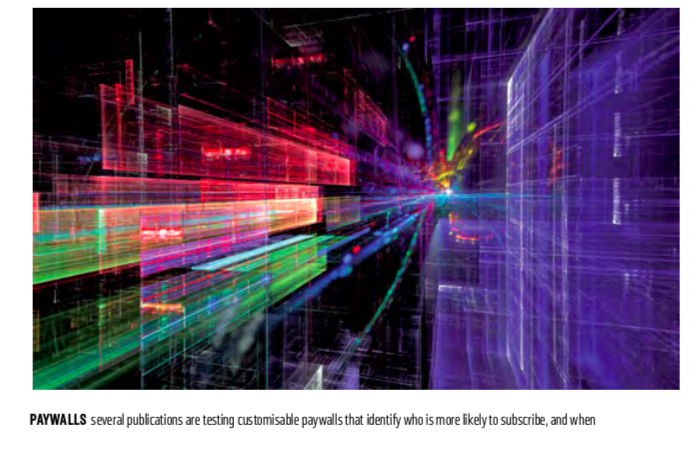 Based on this, the paper calculates their likelihood to subscribe and what level of site access will encourage this. “Now we’ve got a model that’s learned to a point where, if I get a person’s score, I pretty much know how likely they will be to subscribe,” Karl Wells, the Journal’s general manager for membership, told Nieman Lab in February. 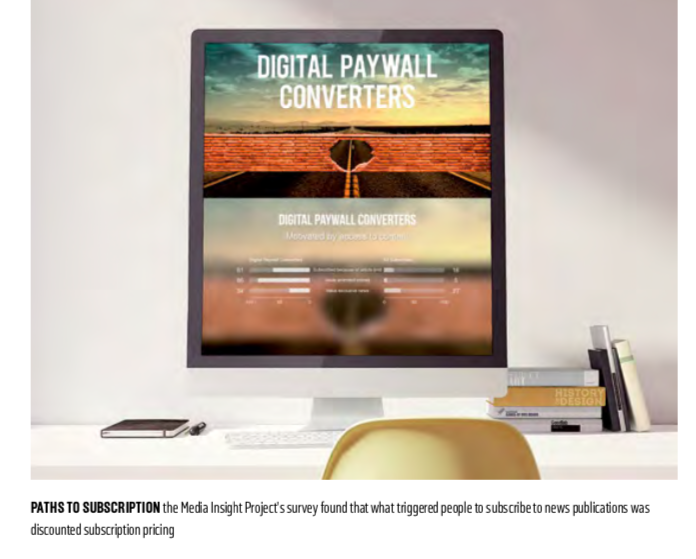 Starting with a pilot project at the Albany Times-Union in autumn 2017, Hearst Newspapers also began testing customisable paywalls: readers would see different subscription offers depending on what they read and how frequently they visited. “We’re trying to find the optimal place for the paywall based on the interests of the consumer,” Rob Barrett, president of digital media at Hearst, told Digiday in March 2018. The paywall, which was rolled out to Hearst Newspapers’ 24 daily and 64 weekly newspapers, aims to build trust and grow loyalty. Scandinavian publishing house Schibsted, which owns leading news titles in Sweden and Norway, has been doubling down on data and a subscription-purchase prediction model, to discover which registered readers are more likely to pay for subscriptions. The model, which records readers’ browsing behaviour, identified those who were three and five times more likely to subscribe. “The importance of having control over our own data, and knowing who the user is, and building a deeper relationship with our subscribers is really key to surviving in journalism,” Eivind Fiskerud, Schibsted’s head of data and analytics for its Norwegian group told Nieman Lab in February. The Times of London is developing a “digital butler” (internally known as James): a self-learning algorithm that will analyse users’ reading habits so that it can serve them with relevant content at the time at which it is most pertinent. It is both intended to keep subscribers happy and hence reduce churn, and boost subscriber numbers by sending non-subscribers effective conversion prompts at the ideal time. By early 2018, The Financial Times’ paying subscribers exceeded 900,000, both print and digital. The paper offers various print and digital subscriptions, including a package for digital during the week and print at the weekend which has proved popular, according to FT Weekend editor Alec Russell. CEO John Ridding told Fast Company that print advertising accounts for just 17 per cent of the company’s financial publishing division’s revenue. Subscriptions have been a healthy revenue stream for The New York Times since the paper launched its paywall in 2011. The New York Times has 3.5 million subscribers, of which 2.5 million are digital-only. “We’ve been growing at a nice clip over the past couple of years. We went from about 10-15 per cent annual growth, to skyrocketing to 30 per cent annual growth in 2015, and then shooting up in 2016, the election year, and continuing that trajectory in 2017 as well,” explained Clay Fisher, senior vice president of consumer marketing and revenue at The New York Times. Subscription revenue accounted for approximately $740 million for the first nine months of 2017, a 12.9 per cent change compared to the same period the previous year. “We’ve declared ourselves a subscription business now: that is reflective of the growth potential we’ve seen and demonstrated over the last couple of years, as we’ve led the industry and surpassed 3 million subscribers, total,” Fisher said. For The Washington Post, high-quality journalism also drives a thriving subscription business. The Post launched its paywall in 2013. After three pieces of content, visitors run up against the Post’s paywall, explained Miki King, vice president of marketing. At The Guardian, reader revenue outweighs income from advertising, but it’s not because of a paywall. Guardian content remains free to read online, but the paper has asked readers to become members, meaning that as well as supporting its journalism, they have special access to live events and dedicated emails. The Guardian counted more than 400,000 regular paying members and subscribers for its print and digital products, and overall, 800,000 readers supported the company in 2017. “Together, the 800,000 contributors (members, subscribers and donors) along with the casual sales of the physical paper, give the Guardian a record number of paying readers; more than the half-a-million pinnacle in print circulation achieved in the late 1980s,” CEO David Pemsel told The Drum. Pemsel said: “Our readers contribute more to this organisation now than advertising.” The CEO outlined the 196-year-old paper has a three year target to break even by April 2019, and predicted Guardian News & Media will drive down its annual losses to £25 million for the year to 31 March 2018 (compared to the £45 million shed last year). As it pores over an audience of 160 million monthly browsers and around 9 million daily uniques, the Guardian will methodically look at ways to turn regular readers into financial supporters. “We are prepared to explore country by country because we know that audiences are slightly different from Australia to the US to here,” Pemsel said. Dutch site De Correspondent was launched via a crowd-funding campaign and remains ad-free, funded purely by its more than 60,000 member-subscribers. The news site aims to offer “an antidote to the daily news grind,” focusing on stories that cover long term issues outside the 24-hour news cycle, and its journalists “are committed to collaborating with members on their chosen beat”. Whether or not micropayments – paying a small amount per article – are a viable reader revenue stream is debatable. Blendle launched in 2014 in the Netherlands, a subscription-based platform where users pay per article for news from a selection of partner publishers. By 2016, it had reached more than 1 million users in Holland and Germany. However, it has been two years since the company launched in beta in the US and its success is unclear. It had partnered with The New York Times, The Economist, and The Wall Street Journal, among others. “We went into it as a test, thinking maybe it helps us get some data points for our strategy when it comes to paywalls or metering, but nothing is happening,” one executive told Digiday. 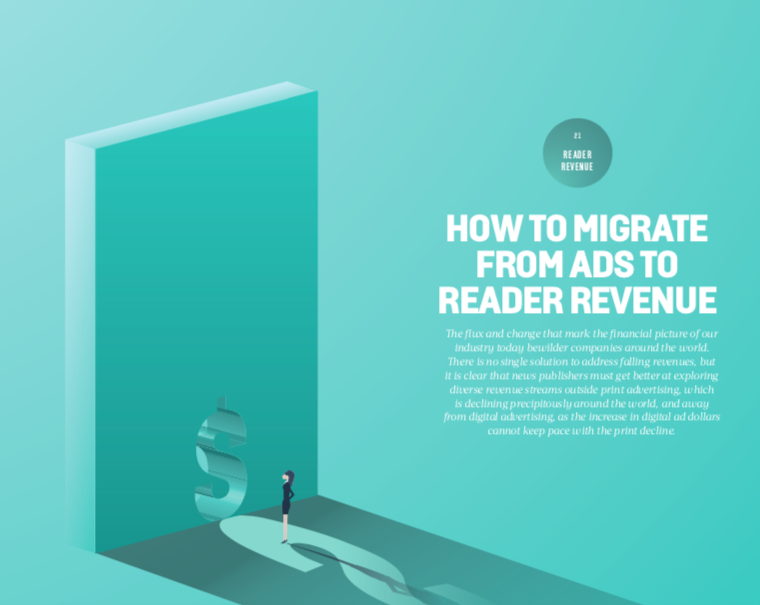 German publisher Gruner + Jahr experimented with ad blocking and micropayments, offering ad- free experiences to users, after they were given a choice to whitelist the G+J site, or pay a few Euro for access, resulting in just €2,000 in revenue for G+J, according to Digiday. Companies such as Munich-based LaterPay offer readers access to stories and keeps tabs on the amount, letting them pay for their reading later. Once readers reach €5, they must pay. While offering news and video for free on their website, Spiegel Online uses this micropayment system, and allows readers to read €5 worth of content or pay for a weekly pass. A single article costs 39 cents. “It sold 3 million stories that way, with nearly three-quarters of the readers that encountered the offer registering and paying when they reached their article limit,” according to Digiday. Although we would argue that pursuing reader revenue is essential, that doesn’t mean it’s a straightforward solution. There is a great deal of competition from both free sources and other paid sources, and there are still many people who are not paying for news and who are unlikely to be convinced. It can be heartening to look towards music streaming service Spotify’s 70 million paying subscribers, or video-on-demand service Netflix’s 118 million, but it is important to remember that music and television/films are very different types of content compared to news. 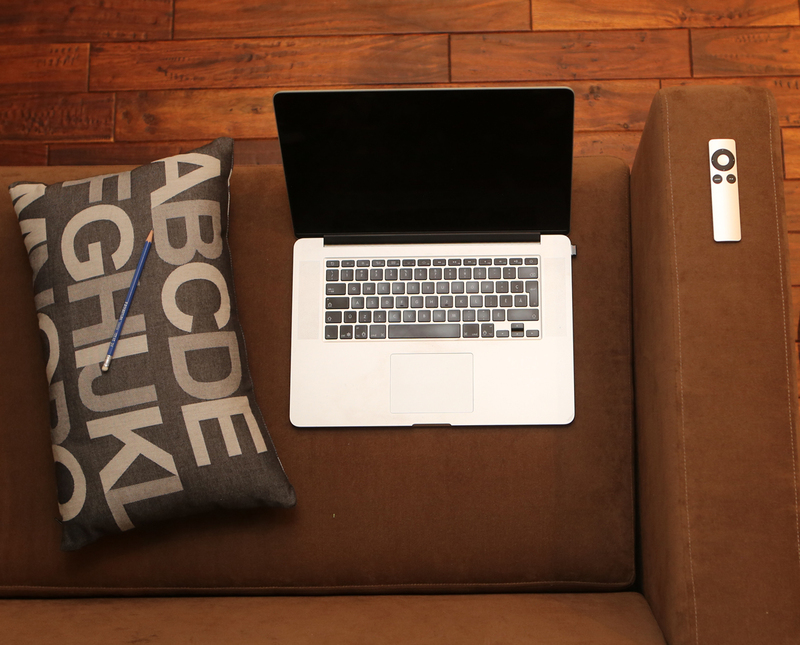 It is first essential that you are able to offer a compelling content proposition with something unique about it, and be able to communicate this. Secondly, you need to find the most effective way to sell this to your audience, which might involve some experimentation with different pay models.